Major General Frank B. 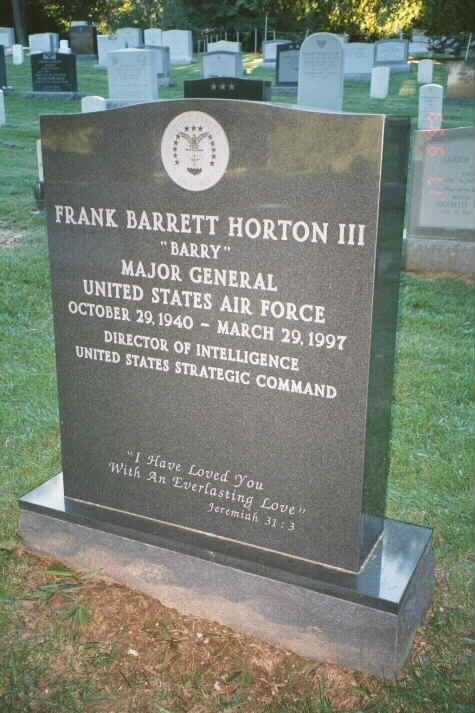 "Barry" Horton III was director for intelligence, J-2, U.S. Strategic Command, Offutt Air Force Base, Nebraska. 1974, Air War College in 1976, the National War College in 1978 and the Joint Flag Officer Warfighting Course in 1989. The general completed Air Intelligence School, Sheppard Air Force Base, Texas, as a distinguished graduate in November 1962. He then was assigned to Headquarters Strategic Air Command, Offutt Air Force Base, as a computer programmer and systems analyst in the Target Programs Branch, Targets Division, Directorate of Intelligence. In June 1965 he entered Harvard University in an Air Force Institute of Technology-sponsored graduate study program. Headquarters 7th Air Force, Tan Son Nhut Air Base, South Vietnam. He returned to the United States and served as executive officer and assistant professor and, later, associate professor in the Air Force Academy political science department. While at the academy he also served in the Plans and Programs Directorate, Headquarters U.S. European Command, during the summer of 1972. 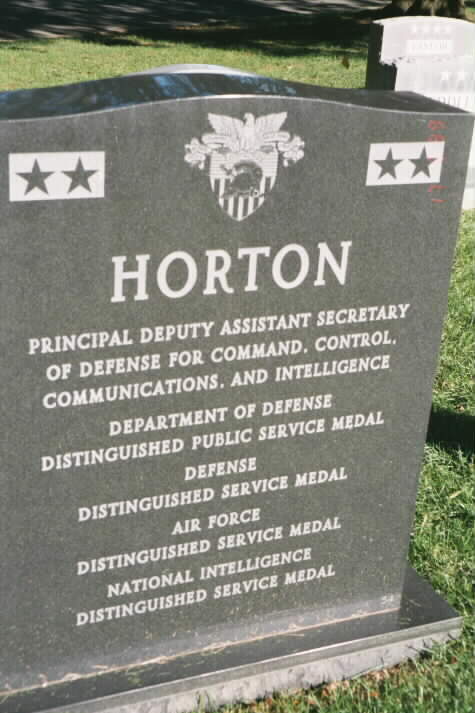 General Horton was assigned as a planning and programming officer in the Office of the Assistant for Analysis, Deputy Director of Plans for Force Development (redesignated the Office of the Assistant Director of Plans for Strategy Development and Analysis), Deputy Chief of Staff, Plans and Operations, Headquarters U.S. Air Force, Washington, D.C., from June 1973 until August 1977. Late in his tour he led the Air Staff team dealing with the Ford-Carter presidential transition. During the 1977-1978 academic year, the general attended the National War College as a student and adjunct faculty member. While in school he served as a research associate in the National Defense University's Research Directorate. In July 1978, he was assigned to Whiteman Air Force Base, Missouri, as assistant deputy commander and then deputy commander for maintenance of the 351st Strategic Missile Wing. During this period, the 351st missile maintenance complex was named best in SAC, winner of the Chadwell Trophy. General Horton assumed command of the 351st Combat Support Group in May 1980. Later that year the general served as crisis management team chief in the secretary of the Air Force's Titan II System Review Group. He returned to Whiteman Air Force Base in January 1981. The 351st won the Blanchard Trophy as best missile wing in SAC in May 1981 at the command's annual missile combat competition. General Horton transferred to Ellsworth Air Force Base, South Dakota, as vice commander of the 44th Strategic Missile Wing in June 1981. In May 1982 the 44th SMW won the Blanchard Trophy as SAC's best missile wing. 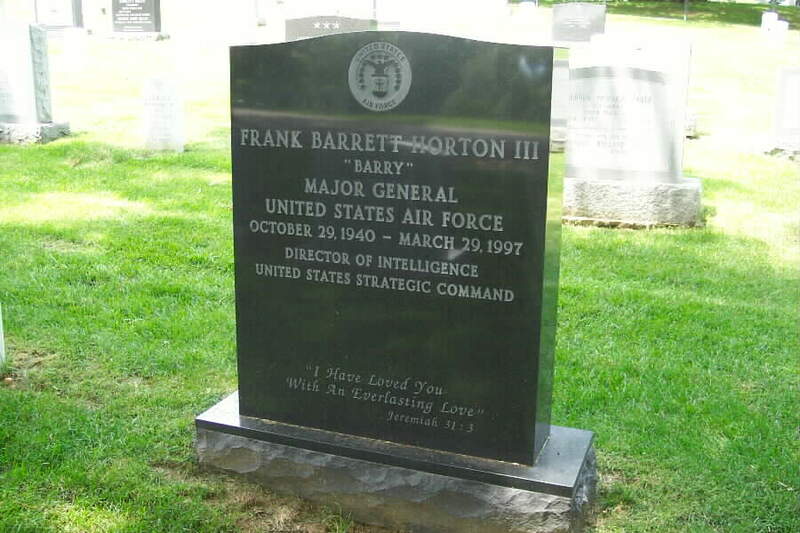 General Horton became commander of the 321st Strategic Missile Wing, Grand Forks Air Force Base, North Dakota, in July 1982. In May 1983 the 321st SMW was named best Minuteman wing in SAC at the missile competition. In June 1984 the 321st SMW won the Charles Trail Award for the best logistics in SAC. In September 1984 General Horton was assigned as director of command control, deputy chief of staff, operations, SAC headquarters. He then became deputy director for the national strategic target list, Joint Strategic Target Planning Staff, in June 1985. While at Offutt Air Force Base, the general also served as chairman of a Joint Chiefs of Staff study group on command control. In September 1986 he was assigned as chairman of the National Intelligence Council, located at CIA headquarters, McLean, Virginia. The general became deputy director for foreign intelligence, Defense Intelligence Agency, Washington, D.C., in September 1987. In March 1990 he was assigned as deputy chief of staff for intelligence, SAC headquarters. He assumed his last position in June 1992. His military awards and decorations include the Defense Distinguished Service Medal, National Intelligence Distinguished Service Medal, Defense Superior Service Medal, Legion of Merit with oak leaf cluster, Bronze Star Medal, Defense Meritorious Service Medal, Meritorious Service Medal and Air Force Commendation Medal. He wears the Master Missileman, Officer Aircrew Member and Joint Chiefs of Staff badges. General Horton has written professionally, including "Comparative Defense Policy," edited with Edward L Warner III and Anthony C. Rogerson, published by the Johns Hopkins University Press in 1974; "Military Perspectives on Nuclear Arms: Myths and Realities," presented to the John J. McCloy Study Group on Nuclear Diplomacy, Council on Foreign Relations, in April 1986; and "Analytical Requirements in a Post Cold War World," presented to the International Studies Association in March 1991. The general is an active member of several professional associations, including the Air Force Association, American Political Science Association, Armed Forces Communications Electronics Association, Council on Foreign Relations, International Institute for Strategic Studies, International Studies Association, National Military Intelligence Association and the Security Affairs Support Association. He was promoted to Major General August 1, 1987, with same date of rank. On March 29, 1997, of Alexandria, VA, husband of Patricia Sue Horton; brother of the late Lee Horton, Sr. Also survived by his mother, Margaret M. Horton Sheridan; three nephews, V. Lee Horton, Eric L. Horton and Joshua B. Horton. Friends may call at DEMAINE SPRINGFIELD-ANNANDALE CHAPEL, Backlick and Edsall Roads, Springfield, VA on Wednesday 7 to 9 p.m. and where services will be held Thursday, April 3, 1:30 p.m. Interment Arlington National Cemetery with full military honors. Memorial contributions may be made to Boy Scouts of America.